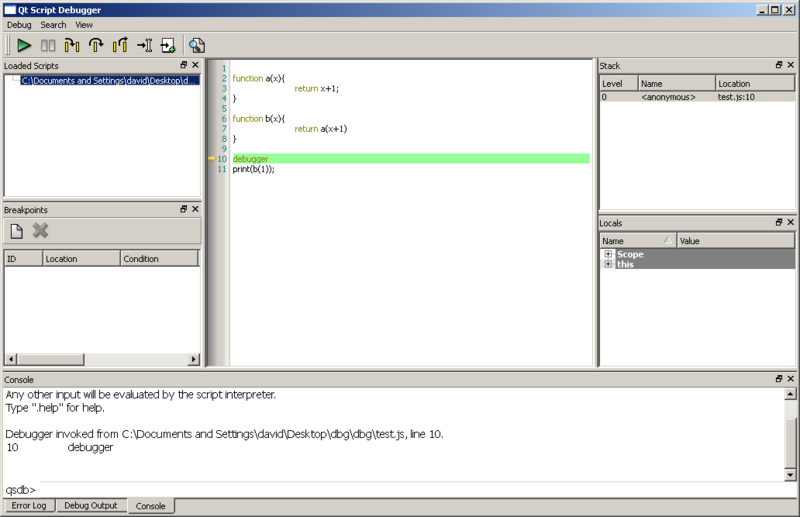 This one comes from the QT 4.8 framework in the form of QTScript. note that you must use the 4.8 branch, in the 5.x branch they have switched over to using v8, and do not appear to have the debugger protocol wired in. Many people complained of this. My personal preference is to use a little bit older libraries and development tools anyway so this is fine for my task. anyway not to get sidetracked, so the QT script framework has a complete debugger interface already built-in that you can utilize in only a few lines of code. Also the QT library has many many users, and there are many help answers available on the net already. Duktape on the other hand has pretty sparse information available as of yet in the help forums or mailing lists. one other aspect you would have to consider if evaluating QT-based components is that your project would either have to be licensed as GPL, or purchase a commercial license for the library. One other plus is that the QT library seems to be extremely well written, easy to use, and open source. I finally found it, you need to add $(QTDIR)\src to your Tools->Options->Projects and Solutions->VC++ Directories->Source files.